I have been in a long running battle with a co-worker over who has the best Italian beef sandwich. For some reason, he thinks it’s a place in Wyoming, MI. While I agree they have a delicious sandwich, the best Italian beef sandwich can’t come from Michigan. That’s like saying the best Coney Dog is from a place in Moline, IL. It may be good….but it’s not going to be the same. I have argued with this co-worker for weeks and weeks now, but he won’t back down. What’s my favorite? Al’s Italian Beef, of course. I’ve argued that many, many, many times on this blog and I stand by it. 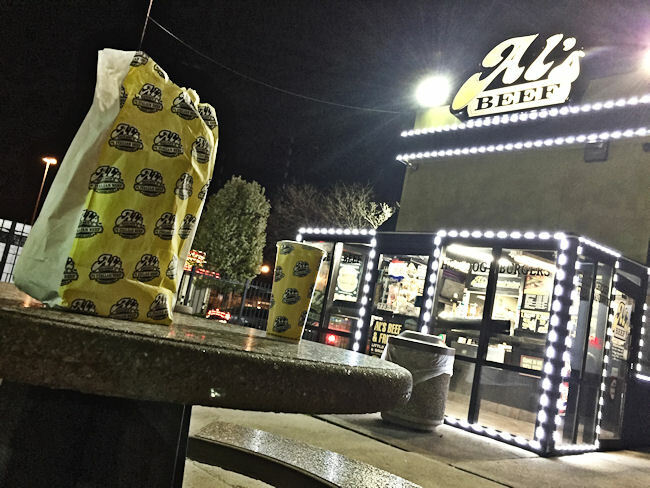 Al’s is still the best Italian beef in the city. I was back in Chicago for a baseball game at Guaranteed Rate Field. 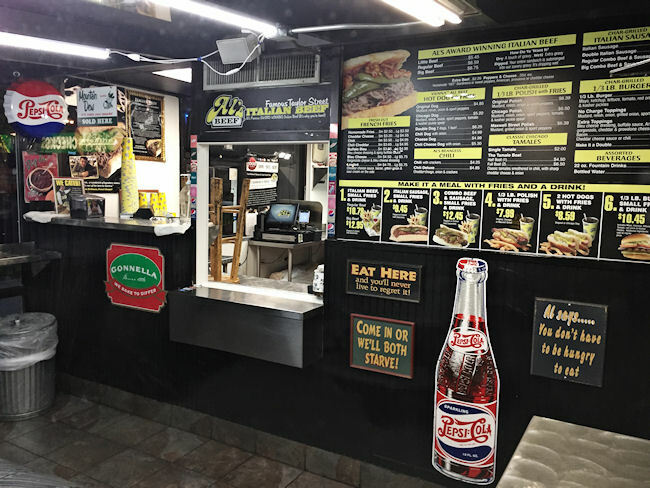 Before the game, I hit a neighborhood joint on the south side and got my Italian beef fix….but the more I thought about it at the game, the more I wanted Al’s. Lucky for me, there’s one that wasn’t too far out of my way. Al’s Italian Beef has a small shop on the corner of Wentworth and Garfield in the Washington Park Neighborhood on Chicago’s south side. The shop is right off the Dan Ryan Expressway in the Grand Boulevard Plaza. This restaurant is incredibly small. In fact, there’s no seating inside. 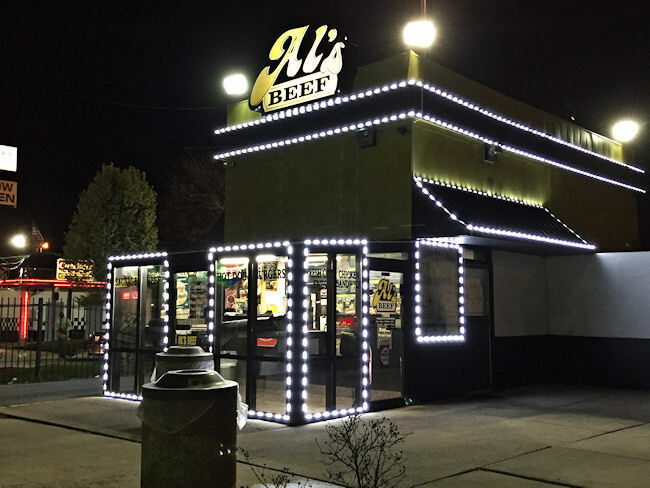 To people familiar with Chicago Italian beef joints, that’s not unusual. 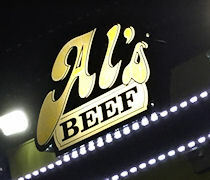 A lot of the best beef joints in the city don’t have any seating…including Al’s flagship store on Taylor. You don’t sit and eat an Italian beef. You stand at a metal counter looking out the winow and “hunch” over to keep all those delicious juices from dripping on to your shirt. This location has a very small inside space with the metal counters about chest high and an order window that looks in to the kitchen. The restaurant is open until midnight on Friday and Saturday’s, but when I got there a little after 10:00, the doors were locked. I wasn’t deterred. I hopped back in my truck and pulled around to the drive thru speaker at the back of the shop and put my order in there. A good Italian beef is impossible to eat in the car, so I had a little bit of a dilemma. I didn’t really want to wait until I got all the way back to Kalamazoo to eat this delicious sandwich, so I improvised. 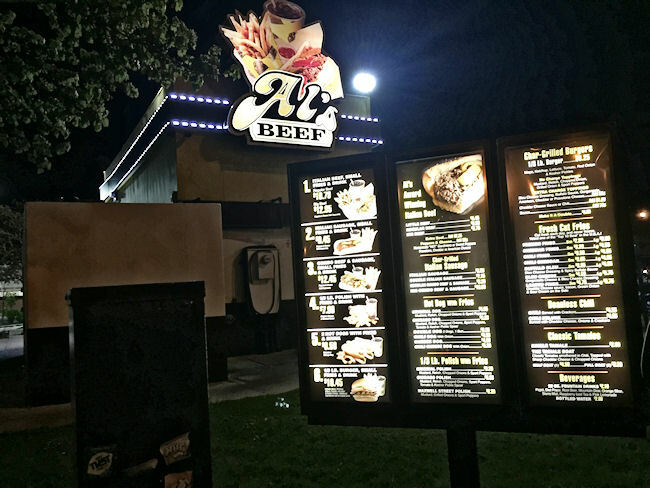 There were concrete tables out in front of the building, so after getting my food from the drive thru, I got back out of my truck and sat at one of these concrete tables at 10:30 at night, by myself because I couldn’t stand the thought of not eating this Al’s Beef after I had already convinced myself I had to have it. I had ordered myself a regular Italian beef, dipped, and with hot peppers. I went ahead and made it a combo and got a large order of fries and a Pepsi to drink. I started in with the fries because the fries are what initially got me going to Al’s. A lot of Al’s competitors keep the fries simple and just do crinkle cut fries they buy from a restaurant supply place. Al’s doesn’t do that. Al’s does what I think of when I think of Chicago fries. 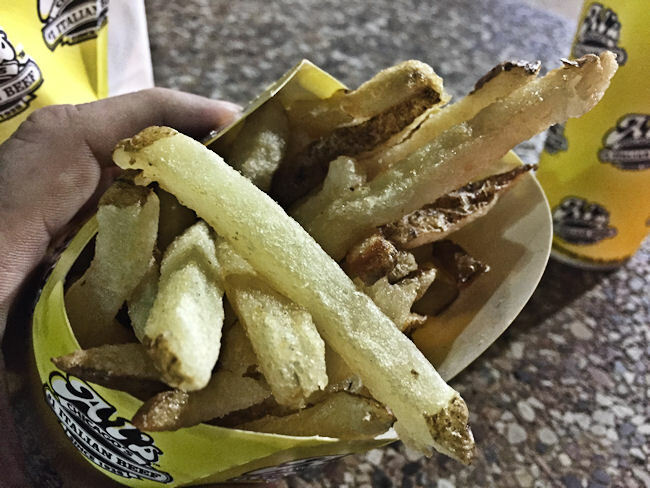 Skin-on, super greasy fries that are full of flavor. When they’re cooked right, the outside has a crunchy, golden brown exterior while the interior is soft and fluffy. These weren’t quite there, but they were still better than the fries you get at most places. 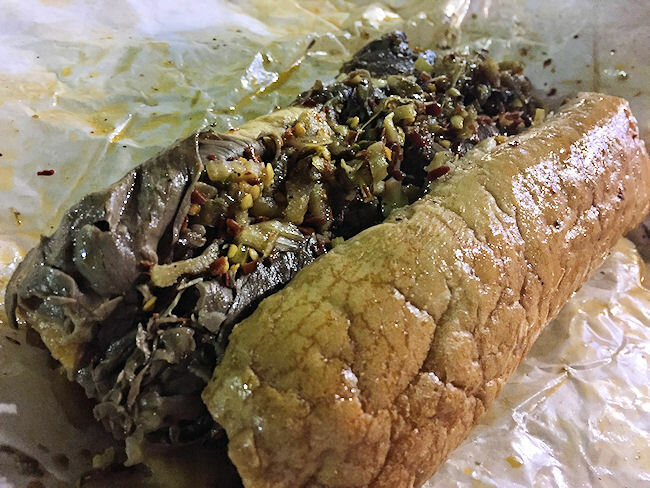 I gave the Italian beef a little extra time to soak in it’s juices and when I was ready for it, I went through the task of unwrapping it from several layers of wax paper and a paper wrapping. Al’s wraps the beef’s up so tight that they continue to steam from the hot gravy that the sandwich is dipped in to. Al’s uses a crusty Gonnella roll that softens right up and soaks up so much of that savory gravy heavy on oregano. This just one of those things that can’t be created outside of Chicago. The bread and the gravy is so good on it’s own, I could eat just that without the meat…but that’d be silly. Why would you pass up the meat? The sandwich comes filled as much as it possibly can be with tender, thinly sliced beef that has been soaking in this very oregano tasting gravy that has soaked through the bun. The meat is heavily spiced before being cooked, but it’s also dry roasted. So much of that flavor comes from the gravy that it is soaked in after it’s sliced. I top my with hot peppers which is a classic mix of pickled veggies and red pepper flakes. The thing I really like about Al’s giardiniera is how finely it’s chopped. You get a good crunch and a lot of flavor in each bit without having to work to open your mouth wide enough to get big pieces of vegetables into a bit with meat and bread. The meal set me back about $14 which I was able to pay with a card. I know it’s not always a popular opinion, but I will rave about Al’s Italian Beef until either they or I are no longer in existence. Everything I think about when I think about Chicago is wrapped up tightly in a little package of bread, meat, veggies, and gravy….and that’s how I always want it to be.